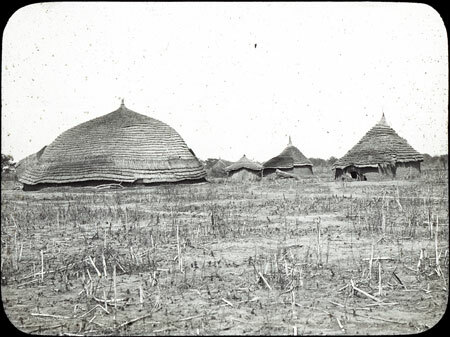 A large cattle byre (left) and other sleeping huts at a Dinka village, probably near Shambe on the Nile. The area around the homestead has stubble from harvested crops, probably the second millet crop that was cut in January or possibly as late as February, which is when the Seligmans seem to have visited the Shambe area in 1910. Manual catalogue entry (thermofax catalogue copy in folder '27-06 Seligman Slide Collection') - "V.g.37. Dinka houses"
Note on lantern slide - "V.g.37. Dinka houses. CGS. 354"
Morton, Chris. "Dinka village" Southern Sudan Project (in development). 03 Jan. 2006. Pitt Rivers Museum. <http://southernsudan.prm.ox.ac.uk/details/1967.26.241/>.